Cervical Angina : An under-diagnosed entity ! We know cardiac pain is often referred to Jaw and neck . 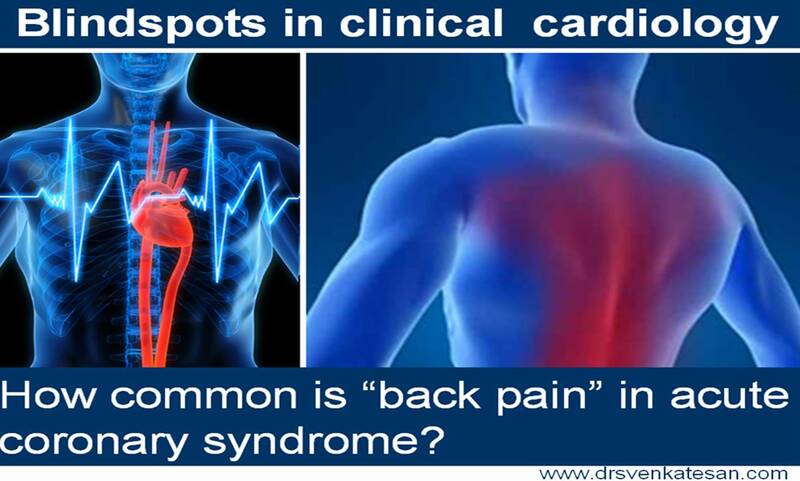 What prevents the neck pain of cervical spinal disease to be referred over the heart ? Can pure spinal lesions mimic angina ? The answer seems to be “Yes” . The neuronal circuit is there .Only , the traffic has to be reversed. Medical logic is always puzzling. 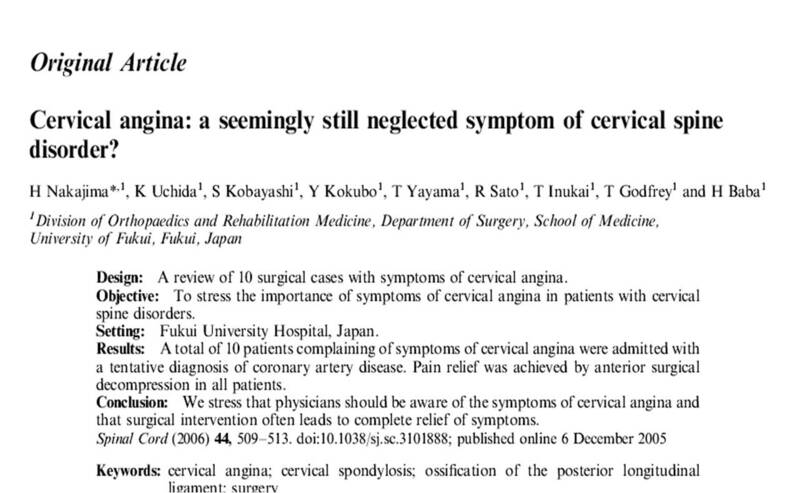 There is indeed an entity called cervical angina. The cardiac pain can be referred any where between dermatomes C3 to T 10 It is generally believed cervical radicular pain can go only one way . . . ie towards the nape of neck and arms .Dermatomal overlap ,neural cross talks thalamic inputs and cortical reflection and perception always make the subject of referred pain too complex. Now,It seems possible ,the neck pain can spill over into the anterior chest wall ,mimicking angina .Imagine the confusion if the patient has both cardiac and cervical entities ! Does the pain signals from the two sites collide in the local spinal network ? Does one extinguish or amplify the other ? This article which was published in the Spinal Cord . 1.Guler Net al.Acute ECG changes and chest pain induced by neck motion in patients with cervical hernia: a case report. Angiology 2000; 51:861–865. 2.Wells P. Cervical angina.Am Fam Physician1997;55 2262–2264. 3.Jacobs B. Cervical angina. NY State J Med 1990;90: 8–11. 4.Baba H et al. Late radiographic findings after anterior cervical fusion for spondylotic myeloradiculopathy. spine 1993;18: 2167–2173. Pulmonary embolism is one of the important causes of acute chest pain . It can mimic acute coronary syndrome . In fact along with aortic dissection , it forms a differential diagnosis for STEMI especailly if the ECG is not typical. Hypoxia induced LV ischemia with coexisting CAD. One can imagine , how difficult for the nervous system to zero in on the origin of this pain as the structures involved in acute pulmonary embolism are in different planes and in different depths within the chest cavity . Patients often complain vaguely the site of pain but what is universal is severe resting pain deep within the chest . If the ischemic lung segment transmit pain signals , the location and radiation depend on the bronchpulmonary segment involved.This again adds on to the complexity in the genesis of pain .It can be virtually any where in the back or front of chest. But , the central and retrosternal chest pain are equally common as invariably the central pulmonary arteries go for a acute stretch which can be severely painful .In fact , current thinking is it could contribute maximum for the intensity of chest pain. Similarly, acute dilatation of RV result in mechanical pain. RV sub endocardial ischemia may also contribute .An intact bronchial circulation( From aorta) can limit the ischemic lung pain . Analysing the chest pain of acute pulmonary embolism can be an interesting academic exercise . It could arise from multiple structures with different mechanisms. It may not be much significant with reference to management . But it has a diagnostic role. A pain which is severe , and atypically located should raise the suspicion of acute PE especially if the patient has associated dyspnea. What will happen if you accidentally thromobolyse early repolarisation syndrome ? Indication for thrombolysis in ST elevation MI is mainly determined by clinical and ECG features. ST elevation of more than 1mm in two consecutive leads with a clinical suspicion of acute coronary event demands immediate thrombolysis. Early repolarisation syndrome(ERS) is a is typical mimicker of STEMI . 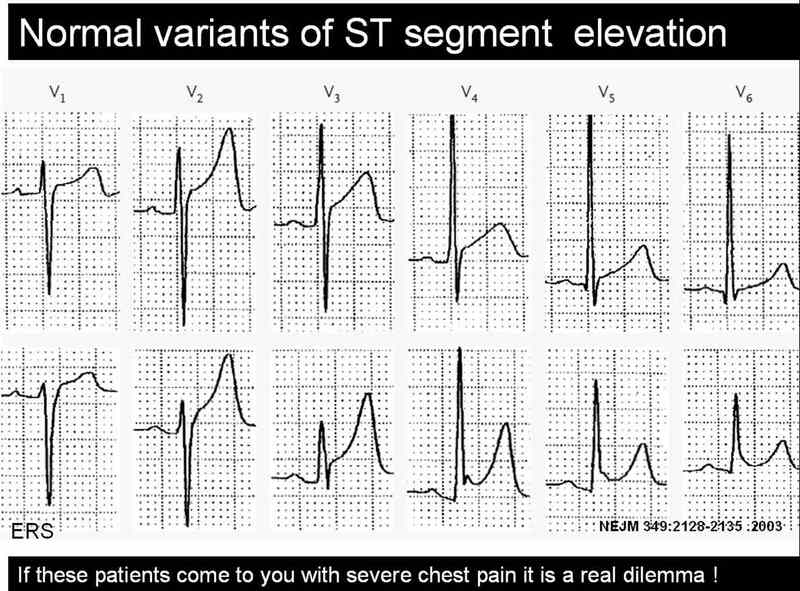 In ERS , ST segment elevation occurs in many leads especially precardial .This entity is estimated to occur in nearly 3-5% of population where a genetic variation in the potassium channel activation is reported. If they land in ER with some sort of chest pain , chances are high for labelling them as ACS . It is not uncommon for CCU physicians to witness an ERS being lysed . Even in many of the land mark trials (ISIS ) there has been many inappropriate thrombolysis , recognised later on. What can really happen if you thromolyse them inadvertently ? Generally nothing happens . But they are exposed to the risk of thromolysis. The ECG changes persist. And troponin will be negative and echocardiogram will not reveal any wall motion defect. Are we legally liable if a patient with ERS was thrombolysed and he ends up with a bleeding complication like stroke ? While the physician may feel guilty , there is no reasons for him to feel so.The guidelines are kept little lineant for the indication for thromolysis. When we are promoting a strategy of early thrombolyis on a population based approach in STEMI , there is bound to have a overlap with normality .The benefits out of early thrombolysis for eligible patients for outweigh the few inappropriate thromolysis. When you want to catch a real criminal it is unavoidable, one gets hold of all suspected criminals before letting them free . Unfortunately in this exercise , some of the innocent might experience intimidation or even a injury at the hands of law enforcers. Similarly if a patient with ERS develop a severe esophageal spasm and typical angina like chest pain he is absolutely certain to receive thrombolysis. (Troponin, CPK come later , and the results never veto the clinical and ECG criteria ,except probably in LBBB) .Many times critical time dependent decisions are prone for errors in CCU. So it may be unscientific to ask why an ERS was thrombolysed ! How can one prevent inadvertent thrombolysis in ERS ? Always ask for the previously recorded ECGs .If it is available and look exactly similar to the current ECG chances are unlikely for ACS. In ERS ST segment is generally concavity upwards . ACC/AHA guideline for STEMI ,is aware of this fact , but still advices thrombolysis for all ST elevation irrespective of the morphology of ST segment elevation. This is propably intentional, not to incorporate morphology cirteria of ST elevation for thromolysis .It would potentially make many true STEMIs diagnosed falsely as ERS and deny thrombolysis. What is the latest news about ERS ? Now data are coming up, ERS is not entirely benign condition.Some of them ( Even a fraction of ERS population could be a significant number) can have a overlap between Brugada syndrome and they could be prone for dangerous ventricular arrhythmia when challanged with ischemic or other stress. What do we mean by atypical chest pain ? Chest pain is one of the commonest presenting symptom in any hospital both as an emergency or non emergency. Reaching an accurate diagnosis is very important. The main purpose of evaluation of chest pain is to recognise it as cardiac or non cardiac origin . Cardiac chest pain almost always means ischemic chest pain . 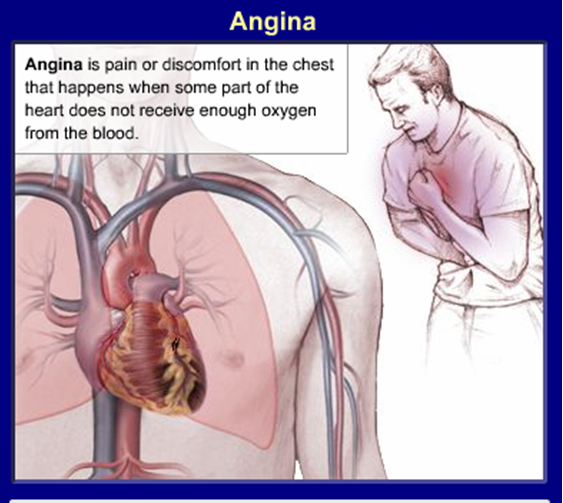 That is called angina. (Of course there are few important causes for non ischemic cardiac chest pain which Will be discussed later). Standard features of typical angina. Chest pain which falls short of typical features are called atypical chest pain . Some recommend at least three typical features to label it as angina. After the clinical examination patients should be categorised in one of the following . Non cardiac chest pain** Non cardiac chest pain is not a diagnosis. Any physician (or a specialist) should take some effort to localise it. (Muscle, nerve , pleura , anxiety etc) . But generally once these patients are ruled out of cardiac pain they become less special and are simply referred back to their family physician, only to return back with another cardiac pseudo-emergency in a different hospital . Why we are diagnosing atypical chest pain liberally ? Currently more number of patients as well as the physicians are aware of the looming epidemic of CAD. The other major reason is the lack of application of mind during foirst clinical appraisal and examination. Many of the patients with non cardiac chest pain (Muscle, nerve , pleura ) are termed as atypical chest pain. Though some of the popular texts use atypical chest pain and non cardiac chest pain interchangeably , it is not correct to do so. For example don’t ever label a patient with chest pain with chest wall tenderness as atypical chest pain and order a cardiac work up .It is a poor model to emulate , that consumes time and resources!.Instead they should be diagnosed a confident non cardiac chest pain and dealt properly. Once a patient is diagnosed atypical chest pain what’s next ? They should get a complete physical examination,ECG, and undergo exercise stress test. In the screening of CAD , angina can be termed a hard sign, atypical chest pain is a soft sign, resting ECG is surprisingly a soft sign again (unless you record it during chest pain). Exercise stress testing is the ideal investigation in evaluation of chestpain. ( 70-80% accuracy). This can be improved upon by Thallium, SPECT, stress echo etc. As of now coronary angiogram is considered the ultimate gold standard (Not pure gold !) to rule out CAD. What do we really mean by atypical chest pain ? In reality we don’t mean any thing ! When a cardiac physician is confused or rather , unable to rule out angina , at the same time he is not confident of calling it as non cardiac chest pain, he has the luxury of using this terminology . It is obvious this terminology should minimally be used. Once diagnosed these patients can’t carry on with this tag for long. They should be reinvestigated , (Right from history and clinical ex) .They should either enter the cardiac work up protocol or a non cardiac source for pain should be fixed immediately. Can primary neural pain originate from heart ? Are we missing an entity called Primary cardiac neuralgia ? Unexplained chestpain even after elaborate investigation is a very common clinical cardiac problem. Cardiac neural plexus has a complex network with mainly autonomic network ,with somatic projections. Neural dysfunction could occur in any organ which has rich neural network.Diabetes is the classical example of cardiac autonomic dysfunction and result in silent ischemia. The same disease can result in stimulation of type c nerve fibres that could result in cardiac neuralgic pain , which we may wrongly attribute to ischemia. One of the manifestation of this phenomenon occurs in syndrome X . Imaging cardiac neurons and sympathetic receptors will shed light on this . But clinical experience has taught us there should be many other sources of cardiac pain other than ischemia and neural pain definitely plays an important role. It may take years to prove this by evidence ! If aortic dissection is the most painful clinical condition why coronary dissection is least painful? Thousands of dissections happen in cath labs all over the world every day very rarely it is painful . The answer is not clear. Both have rich vasa nervorum. Aortic dissection involves media and smooth muscle . Coronary dissection may also be a equally painful , probably we are not recognising it ! or we attribute all chest pain in ACS to ischemia .